This post is brought to you by Lion Brand Yarn, which also provided yarn support. 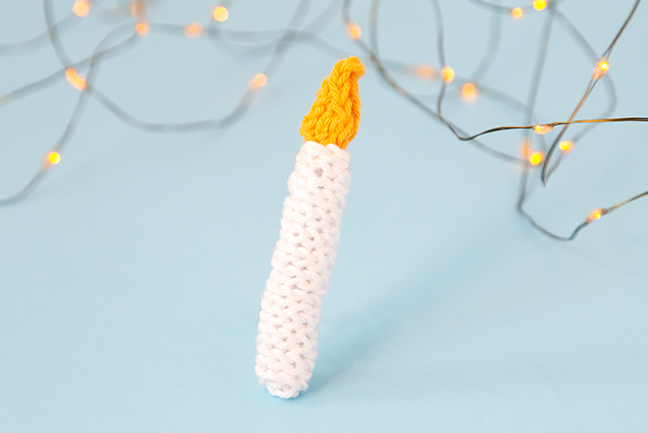 A sweet candle is the 22nd ornament in our series. 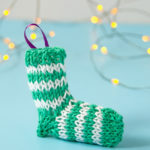 :) This little buddy is one of our smallest ornaments of Christmas, which also means it’s one of the quickest to make! 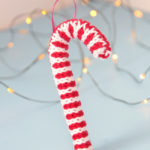 Fans of last year’s Candy Cane Ornament (a.k.a. What’s not to love about provisional cast ons, grafting, and pipe cleaners?) 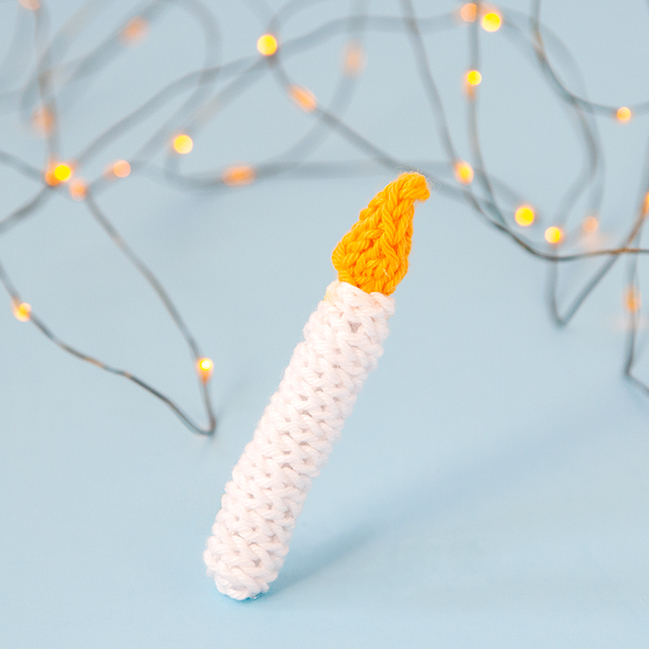 will enjoy making this candle too. 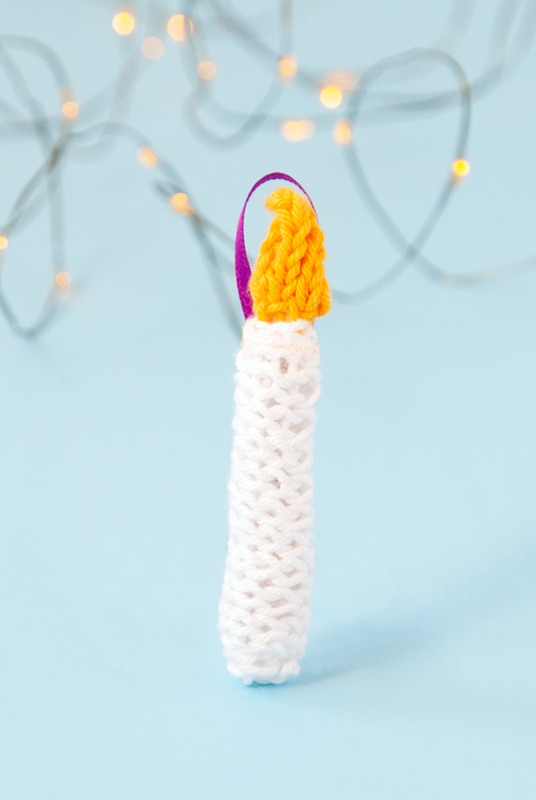 This snuggly wee ornament can be easily knit in under an hour, making it the perfect little finished object to shoe horn in during the busy holiday season. 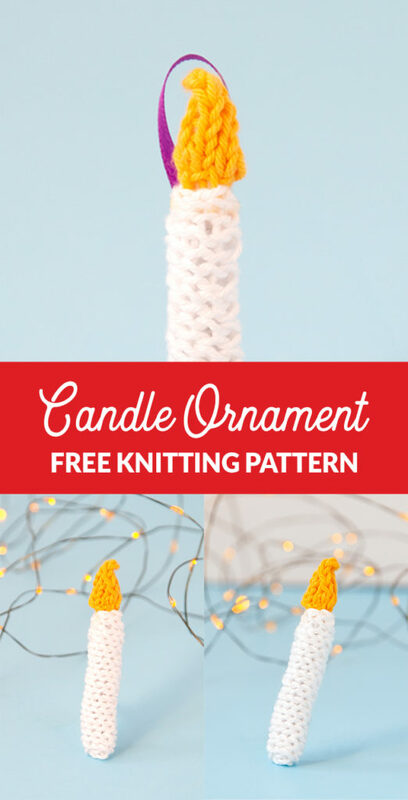 This Knit Candle Ornament is incredibly scrap yarn-friendly, and offers lots of possibilities for creative interpretation. Change the colors, add some stripes! Embroider on some drippy wax! Have fun! 1 pack Lion Brand Yarn Bonbons in Beach, which comes with 8 mini skeins. 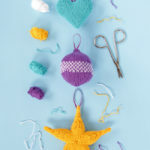 – You need less than a skein of white and yellow to complete the ornament. provisional cast on – a cast on that gives you access to your stitches later in your project. Here’s a tutorial. kitchener stitch – aka grafting, this is a technique for joining ends with a seamless appearance. Here’s a tutorial. Gauge & dimensions: 22 sts & 28 rows over 4 inches, knit in stockinette stitch. Finished ornament measures approx. 3.25″ tall. Looking for a printer-friendly version of this pattern? Grab an inexpensive, ad-free & printer-friendly PDF of this pattern here, or read on for the blog version. CO 12 sts in white using a provisional cast on. row 1. (RS) sl 1 wyif, k7. row 2. (WS) sl 1 wyif, p7. rows 3-8. Rep rows 1-2. Join ends using kitchener stitch. CO 8 sts in yellow, join into rnd. 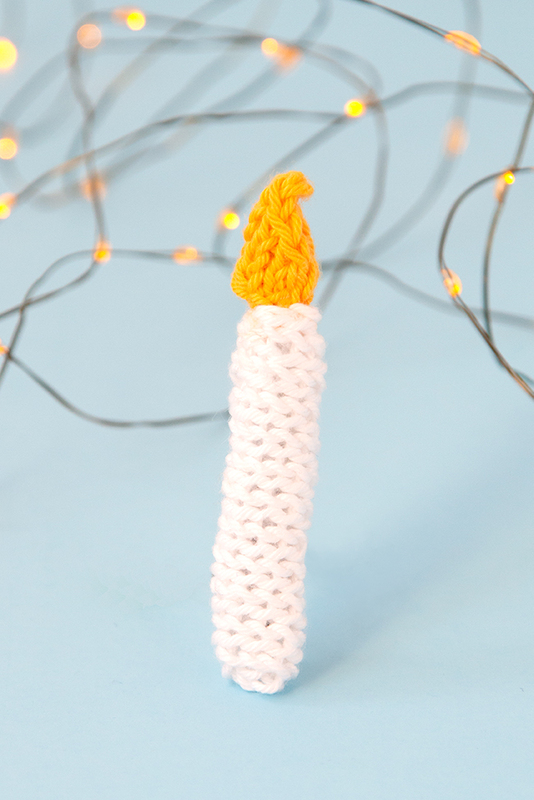 Sew candle flame to candle body. Weave in all ends. Cut a 3.5″ length of white pipe cleaner. 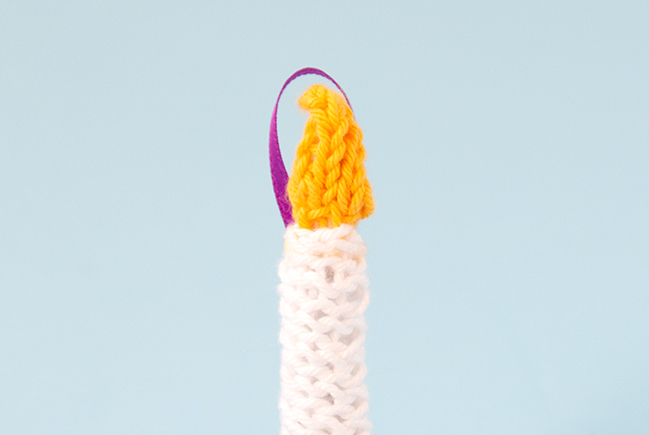 Fold each end of the pipe cleaner down 1/4 of an inch to protect sharp points. 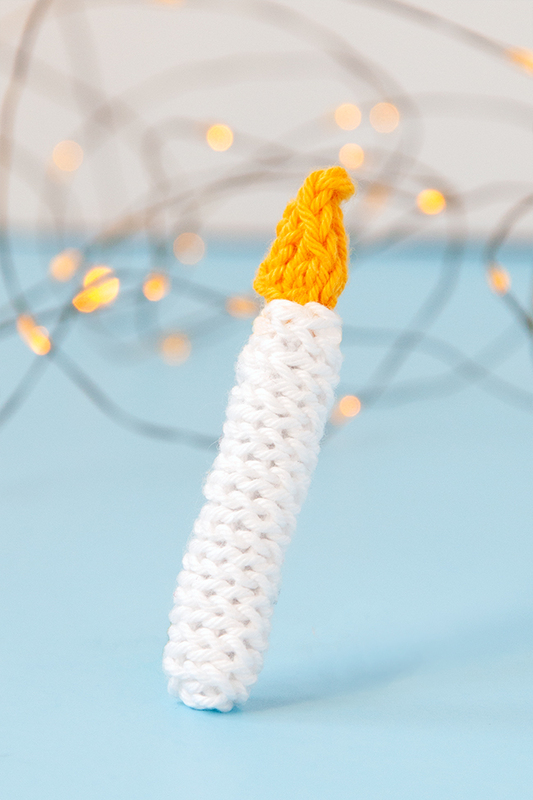 Feed your pipe cleaner into the bottom of the candle body and up into the flame. 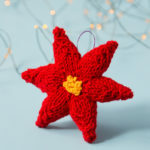 Using a needle & thread, sew a scrap of ribbon to the back of your finished ornament to hang. If you make this or any of the other ornaments in the Ornaments of Christmas series, don’t forget to share your creation online using #handsoccupiedhohoho. Previous Post: « Checked Snood Kit Giveaway from Berroco! Superb!! Thanks for sharing this pattern.